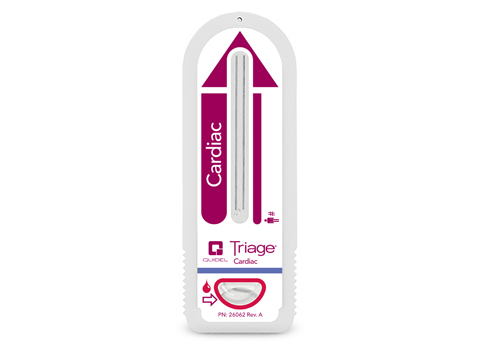 The Quidel Triage Cardiac Panel is a rapid, point of care fluorescence immunoassay used with the Quidel Triage MeterPro. This test is designed to determine the level of creatine kinase MB (CK-MB), myoglobin and troponin I in EDTA anticoagulated whole blood or plasma specimens. This can be used as an aid in the diagnosis of myocardial infarction (injury). 2. Ng SM, Krishnaswamy P, Morissey R, Clopton P, Fitzgerald R, Maisel AS. Ninety minute accelerated critical pathway for chest pain evaluation. Am J Cardiol. 2001; 104: 1454-1456.